The BBC Trust has told the BBC that the only way its on-demand content should be accessed is through iPlayer. This means that other services like Freeview, Sky, Virgin Media and Freesat that offer programme catch-ups won't be able to pick and choose BBC content to offer as part of their on-demand services. The conclusions come from the Trust's ongoing review of how the BBC syndicates digital content. 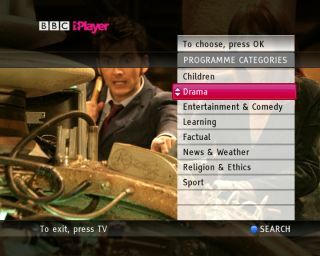 TV platform operators can, however, use the iPlayer interface to offer on-demand BBC programming, as long as it is offered in "standard formats that the great majority of other TV operators can readily adopt". So there'll be no custom-made iPlayer skins for any multi-million-dollar-wielding operators, except "in exceptional cases". With internet-connected TVs and set-top boxes set to explode this year, many are already offering dedicated iPlayer apps and shortcuts. BBC Trustee Diane Coyle led the syndication policy review and explains that, "we know that audiences get the most out of BBC programmes when they access them in a context that is consistent, familiar, distinctive and free to air, like the iPlayer. "As the number of platforms and the popularity of on-demand TV grows, ensuring that licence fee payers have convenient access to all the BBC's services on demand is vital to the BBC's ability to fulfil its public purposes. "The BBC must continue to deliver what licence fee payers want while also delivering value for money and protecting the BBC's brand. We're now seeking views on these proposed changes to the syndication policy to help the BBC meet that challenge in an on-demand world."